Which Herbal Remedies for Toenail Fungus Work? Which Herbal Remedies for Toenail Fungus Really Work? Many people overlook herbal remedies because they’re unconvinced that plant-based medicines have the power to fight stubborn yellow toenail fungus. The truth is, some herbal remedies are just as effective than their pharmaceutical counterparts. Researchers discovered a topical solution that eradicated one volunteer’s nail fungus. The solution contained arrowroot, baking soda, basil oil, tea tree oil, sage oil, and clove oil. The researchers predicted that this solution would eradicate fungal nail infections. Before you head off to mix-up this solution, let’s explore some further research to determine which herbal formulation will work best for fungal toenail infections. 1.1 What Causes Toenail Fungus? 1.2 Why Do I Have a Fungal Nail Infection? 1.3 Why Treat Fungal Nail Infections with Herbal Remedies? 1.10 Can Turmeric Treat Onychomycosis? 1.13 Can Baking Soda Remove Toenail Fungus? 1.13.1 What Kills Toenail Fungus Naturally? Topical Herbal Treatments – Certain essential oils inhibit yeast and fungi, allowing the nail time to heal. Oral Herbal Remedies – Fungus tends to strike when our immune system is weakened. Often this is caused by stress, or vitamin and mineral deficiencies. We’ll show you which herbs will boost your immunity and discourage fungal infections. Fungal infections can take many months to heal. Infections on the nail are particularly challenging to treat because topicals have a hard time penetrating the tough and resilient nail. For this reason, topical treatments need to be applied consistently, and should ideally be combined with oral treatments. Some natural remedies can be applied topically and taken orally. When we have a fungal toenail infection (onychomycosis), there is an overgrowth of yeast or fungi on the nail bed. These fungal spores feed off the keratin – causing the toenail to become yellow, flaky, or thickened. As the spores multiply, a foul odor develops. Fungal toenail infections are usually caused by dermatophytes (a type of fungi). Less often, they are caused by Candida albicans (a type of yeast). Try to determine which toenail infection you have so you can choose a treatment most suited to your needs. If the infection is caused by a dermatophyte, it usually starts at the tip of the toenail and gradually works its way down towards the cuticle. Also, the toenail becomes thickened, and flaky, and may start to move away from the toenail bed. Most fungal toenail infections are caused by dermatophytes. Trichophyton is the type of dermatophyte that is usually responsible. Candida is more likely to occur on the fingernails but can occasionally occur in the toenails (it can also spread from the fingernails to the toenails). Candida also causes oral thrush and athlete’s foot. If a toenail is infected with candida, you don’t typically see the infection working its way down from the tip of the toenail to the cuticle. Instead, the nail becomes yellow all over, or white and yellow spots appear sporadically underneath the nail. Some herbal remedies are particularly effective at eradicating yeast. Why Do I Have a Fungal Nail Infection? Poor Foot Hygiene – dirty socks, old shoes, using communal sports facilities and failing to dry your feet after washing can cause this condition. A Weakened Immunity – this could be due to a medical condition, a poor diet or stress. Diabetes – one-third of people with diabetes have fungal toenail infections due to poor circulation in the feet and unstable blood glucose levels. Herbal remedies can provide natural solutions to all of these problems. This is why, when used correctly, they can become powerful treatments for fungal nail infections. Antimicrobial and Antifungal – Many essential oils can discourage or exterminate the fungi or yeast spores caused by poor foot hygiene. Immune-Boosting – Some herbs, when taken orally, can boost immunity and discourage fungus. Herbs should be used in conjunction with diet to enjoy the most benefits. Anti-inflammatory/Regulate Blood Glucose – Some plant-derived oils have hypoglycemic qualities. These oils can help a person with diabetes to reduce the amount of sugar in their blood. Consuming these natural oils orally helps to reduce diabetic symptoms, such as onychomycosis. Why Treat Fungal Nail Infections with Herbal Remedies? Pharmaceutical drugs have more side-effects than herbal ones. Fungal nail infections are sometimes treated with a low dose of antibiotics. Some clinical trials have found herbal remedies to be just as effective as their pharmaceutical equivalents. The smell of toenail fungus can be hard to mask. Herbal oils are more pleasant than pharmaceutical fragrances, and they can disguise odor more effectively. Experimenting with herbal remedies encourages you to view your body holistically. Rather than treat the toenail fungus, herbal remedies allow you to tackle the underlying conditions. This essential oil is valued for its anti-microbial, anti-fungal and odor-eliminating properties. Tea tree oil could well be the ‘gold-standard’ herbal treatment for toenail fungus. According to Semantic Scholar, tea tree oil (Melaleuca alternifolia) is just as effective as 1% clotrimazole solution at clearing a fungal toenail infection. So, if you are looking for a natural alternative to a pharmaceutical-grade anti-fungal cream, tea tree oil could be the ideal solution. Most aromatherapists agree that it is safe to apply ‘neat’ essential oils to the nail, but not to the skin. Essential oils should be diluted in a carrier oil when applied to the skin surrounding the nails. If you alternate between these two treatments, you’ll see quicker, longer-lasting results. Tea tree and coconut oil are natural products that can ‘ease’ you into the world of herbal remedies. According to ChiroFind, when taken orally, olive leaf extract helps people with diabetes to regulate their blood glucose levels. Foot and ankle complaints (including fungal nail infections) are less likely to arise. If they do occur, they’ll heal a lot faster when blood glucose levels are under control. If you plan to use olive leaf extract for toenail fungus, look out for ‘oleuropein’ supplements. Oleuropein is the naturally occurring polyphenol that is extracted from olive leaves. Follow the instructions on the label and allow 1 – 3 months for the toenail fungus to reduce. If you are diabetic or have a chronic disease, you should discuss supplements with your doctor. This herbal remedy can be applied topically, too. It can slow the growth rate of dermatophytes, yeasts, molds, and many other bacteria. Thyme essential oil has anti-microbial properties so it may be useful for treating a variety of bacterial and fungal infections. However, according to WileyOnline, thyme essential oil is especially effective at eradicating candida albicans. It is the active ingredient thymol that gives thyme oil its antifungal properties. Thymol is also found in oregano oil. Opt for thyme over oregano as thyme contains more thymol. Candida is more likely to affect the fingernails, but it can affect the toenails. If your toenail has turned yellow in its entirety, this suggests candida. 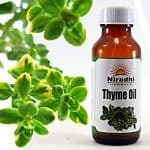 Nonetheless, thyme is thought to be effective at treating fungal nails caused by dermatophytes, so anyone who has a fungal nail infection could benefit from this oil. Massage this mixture into the feet – be sure to massage the oil into your cuticles and across the tops of the toenails. These essential oils can be blended with castor oil. Like coconut oil, castor oil stops fungi from spreading. Castor oil is lighter than coconut oil, so it’s suitable for sensitive skin. Castor oil also minimizes inflammation in the skin. If your toes are sore or swollen from the infection, castor oil treatments are recommended. According to Acta Pharma Journal, aniseed oil (Pimpinella anisum L., Apiaceae) can inhibit four species of dermatophytes – including Trichophyton. Trichophyton is the fungi most responsible for toenail infections. Also, researchers found aniseed oil slowed down the spread of candida yeast. So, aniseed oil (or anise seed oil) seems another good ‘all-round’ treatment. Aniseed essential oil can be particularly potent, so try to avoid getting it on the skin around your toes. If you have sensitive skin, you should treat your feet to an essential oil foot soak. If you repeat this process daily for a mild infection, you should start to see results in 1 – 2 months. This might seem like a long time to wait, but the wait-time for pharmaceutical topicals is very similar. While topicals can kill the fungi and stop them spreading, you’ll ultimately need to wait up to 6 months for the damaged toenail to grow out. Many studies have shown that lavender has anti-microbial and anti-inflammatory properties. While still a potent essential oil, most people can tolerate lavender essential oil without experiencing a skin reaction. So, if you’ve got sensitive skin, lavender oil could be a suitable option. Perhaps the most endearing asset of lavender oil is its smell. The smell is strong enough to mask offensive fungal odors, yet floral enough to please most people’s tastes. Apply lavender oil directly to your infected nail using a Q-tip. Repeat this daily to manage your foot odor. The study mentioned during the introduction recommends basil oil and clove oil for the treatment of onychomycosis. Let’s explore why you should consider adding these to your herbal regimen. Clove oil (Eugenia caryophyllata) can fight candida and fungal infections effectively. Not only that, it can provide pain relief and help to boost circulation in the feet. Poor circulation is linked to many foot conditions, including fungal nail infections. If you get into the habit of itching your nails, the fungal infection will spread to other parts of the body. Basil oil can help prevent this because it soothes the skin and stops itching. These essential oils should be diluted in a carrier oil if you are going to apply them directly to the skin. If you intend to apply them to nail only, use a neat solution with care. Always carry out a patch test first. According to a study on Science Direct, turmeric can treat fungal nail infections caused by the dermatophyte ‘trichophyton,’ but it may not be an effective treatment for yeast infections (candida). We know that most toenail infections are caused by Trichophyton rubrum, so turmeric will be a useful treatment for most people. If you want to use this as a topical treatment, apply turmeric essential oil to the toes (rather than turmeric powder or freshly ground turmeric root). This study found that turmeric essential oil was the only form of turmeric that was able to halt the spread of fungi. However, this doesn’t mean you should avoid dietary forms of turmeric. Cooking with turmeric powder or fresh turmeric root may help strengthen your immunity. Garlic is another immune-boosting food that may ward off fungal infections. When garlic is cut, it produces a compound called allicin. Allicin has extremely potent anti-microbial properties, but these properties are only available for a few seconds. Rubbing fresh garlic on your toenails is unlikely to help. There is evidence to suggest that eating more garlic can improve immune function. If you have a weakened immune system due to stress or a poor diet, then consuming more garlic may help prevent fungal infections. If you don’t like the idea of eating more garlic, try supplementing instead. It’s important to wait at least 2-3 months before evaluating the results of an oral herbal treatment. When coupled with topical herbal treatments, a change in diet could help you eradicate your toenail problems. So, what dietary changes should you make? Include more probiotics in your diet. Probiotics encourage your stomach to harbor disease-fighting bacteria, so you’ll put up a stronger fight when fungal spores attack. Eliminate (or reduce) processed sugars from your diet. This is crucial for diabetics, but it applies to everyone. Fungi and yeasts feed off sugar, and there is some evidence to suggest that dietary sugar plays a role in the proliferation of fungal nail infections. Can Baking Soda Remove Toenail Fungus? Essential oils work well if they are given time to penetrate the nail. At the same time, oils are lubricants, so may cause the feet to become sweaty when they’re left on for too long. Evidence suggests baking soda is useful for treating fungus because it draws moisture away from the infection. If you intend to keep oils on your feet overnight, baking soda will help absorb excess moisture, so yeast and fungi cannot proliferate. Arrowroot powder is also used to ‘mop up’ the moisture caused by a fungal nail infection. You could try adding arrowroot to the herbal treatments mentioned here, though many people find success with baking powder alone. The small study from 2007 predicted that a mix of arrowroot, baking soda, basil oil, tea tree oil, sage oil, and clove oil might get rid of toenail fungus in the wider population. Many studies support the claim that tea tree oil is an effective treatment for yeast and fungi, so this is a remedy worth trying. Also, we know that basil and clove oil are complementary oils that should speed up the healing process. Baking soda should be included in herbal treatments because it helps draw moisture away from the infection. However, not all the herbs mentioned in the 2007 study seem to be necessary. According to NCBI, sage had the weakest antifungal properties compared to other herbal products. These alternatives include thyme, lavender, aniseed, and olive leaf extract. Indeed, if a candida toenail infection is suspected, thyme oil should undoubtedly be included in your treatment. 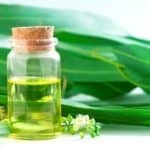 Toenail Fungus and Eucalyptus Oil – Does It Work?